Some might think Accessibility Day is a strange name for a Windmill Hill Pinnacle Association [WHPA] program, but it’s to the point. The event, on Saturday September 15, 10:45 AM-2:30 PM, is a special opportunity for those who cannot hike long distances over uneven ground to get to a rural site that always offers an awesome view. Once a year, WHPA makes that trip possible by providing transportation to those who need it. 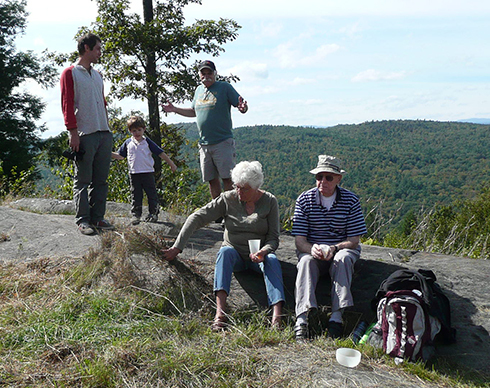 The trip’s destination is a private property that sits atop the Windmill Ridgeline between the Pinnacle overlook and Paul’s Ledges, totally surrounded by Pinnacle Association lands, with a spectacular view of the ski mountains of Mt. Snow, Stratton, Bromley, Okemo, and beyond. For adults who have difficulty walking, this is the chance to visit – perhaps with a grandchild or friend – a spot that would have been otherwise impossible. The free program’s popularity and need for four-wheel-drive or other appropriate vehicles make advance registration a MUST for riders. Hikers do not need to pre-register. Please bring water, bag lunch, and sweater for chilly weather. Meet at Westminster West Church at 10:45 AM to carpool. Register with Tony Coven at 802-387-6650. Held in sunny or cloudy weather, the event will be canceled in rain or bad weather. Click here for directions to the Westminster West Church.